Sleep was long considered just a block of time when your brain and body shut down. Thanks to sleep research studies done over the past several decades, it is now known that sleep has distinct stages that cycle throughout the night in predictable patterns. How well rested you are and how well you function depend not just on your total sleep time but on how much sleep you get each night and the timing of your sleep stages. Sleep is divided into two basic types: rapid eye movement (REM) sleep and non-REM sleep (with three different stages). (For more information, see “Types of Sleep” on page 5.) Typically, sleep begins with non-REM sleep. In stage 1 non-REM sleep, you sleep lightly and can be awakened easily by noises or other disturbances. During this first stage of sleep, your eyes move slowly, your muscles relax, and your heart and breathing rates begin to slow. You then enter stage 2 non-REM sleep, which is defined by slower brain waves with occasional bursts of rapid waves. You spend about half the night in this stage. When you progress into stage 3 non- REM sleep, your brain waves become even slower, and the brain produces extremely slow waves almost exclusively (called Delta waves). Stage 3 is a very deep stage of sleep, during which it is very difficult to be awakened. Children who wet the bed or sleep walk tend to do so during stage 3 of non-REM sleep. Deep sleep is considered the “restorative” stage of sleep that is necessary for feeling well rested and energetic during the day. During REM sleep, your eyes move rapidly in different directions, even though your eyelids stay closed. Your breathing also becomes more rapid, irregular, and shallow, and your heart rate and blood pressure increase. Dreaming typically occurs during REM sleep. During this type of sleep, your arm and leg muscles are temporarily paralyzed so that you cannot “act out” any dreams that you may be having. You typically first enter REM sleep about an hour to an hour and a half after falling asleep. After that, the sleep stages repeat themselves continuously while you sleep. As you sleep, REM sleep time becomes longer, while time spent in stage 3 non-REM sleep becomes shorter. 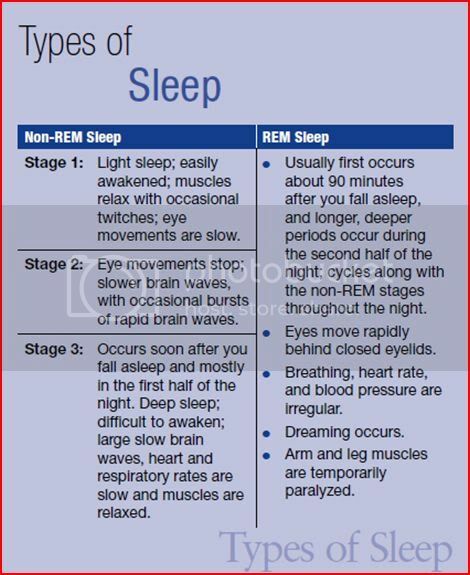 By the time you wake up, nearly all your sleep time has been spent in stages 1 and 2 of non-REM sleep and in REM sleep. If REM sleep is severely disrupted during one night, REM sleep time is typically longer than normal in subsequent nights until you catch up. Overall, almost one-half of your total sleep time is spent in stage 2 non-REM sleep and about one-fifth each in deep sleep (stage 3 of non-REM sleep) and REM sleep. In contrast, infants spend half or more of their total sleep time in REM sleep. Gradually, as they grow, the percentage of total sleep time they spend in REM continues to decrease, until it reaches the one-fifth level typical of later childhood and adulthood. Why people dream and why REM sleep is so important are not well understood. It is known that REM sleep stimulates the brain regions you use to learn and make memories. Animal studies suggest that dreams may reflect the brain’s sorting and selectively storing new information acquired during wake time. While this information is processed, the brain might revisit scenes from the day and mix them randomly. Dreams are generally recalled when we wake briefly or are awakened by an alarm clock or some other noise in the environment. Studies show, however, that other stages of sleep besides REM also are needed to form the pathways in the brain that enable us to learn and remember.